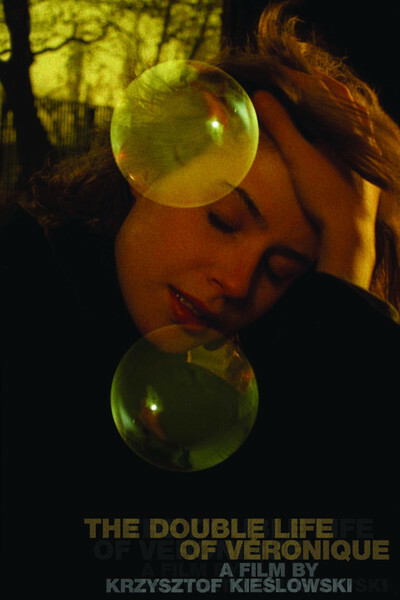 It is important to resist the temptation to figure out every last detail of “The Double Life of Veronique,” the mysterious and poetic new film by Krzysztof Kieslowski. That way lies frustration. The parts do not quite fit, and anyway this is not a puzzle to be assembled. It is a romance about those moments we all sometimes have when we think we see ourselves at a distance. Is there, we wonder, more than one me? Why haven’t I ever seen a portrait in a gallery that looks exactly like myself - or anyone I know? How would I feel if I did? The movie is about two young women, one named Veronique, one named Veronika, both played by Irene Jacob. They never quite meet, although their paths almost cross one day. One lives in France, the other in Poland. They were born on the same day. They have identical heart problems. They are both wonderful singers. One dies, the other doesn’t. The movie could have been truly confusing if it cut back and forth between the two women, both played by the same actress, but it doesn’t. We follow the Polish Veronika until she shockingly collapses during a music recital, and then we pick up the thread on Paris. This is the reverse of what Luis Bunuel once did when he had two different actresses play the same woman interchangeably. With Kieslowski we are also a little confused: Is this the same woman? Did she not really die? We listen for clues. Then we realize there are none. First we saw one woman, now we see the other. There is a long central section in the film which is a triumph of narrative technique. Veronique receives a tape in the mail. She listens to it, and eventually is able to identify it as the sounds in a train station - a particular station. She has received other clues, from a secret admirer who seems to challenge her to find him. She follows the clues, using enormous ingenuity, but when she finally meets the admirer she is chagrined, because there was nothing there, really, but the game, and somehow she felt there would be truth and illumination at the end of her quest. Perhaps this part of the film is a parable for the puzzle that Kieslowski has set us. Sometimes I play a game in my life, which consists of returning to an exact place and time and duplicating an exact action. Here I am again, I think, following my own footsteps. This cafe, on a rainy morning in Paris in the winter. The same waiter, the same order, the same book in my hand. And next year I will do this again. The problem with these games is that they are locked in time. I can always repeat my action next year, but never last year. I cannot make an appointment in the past. Something like that game is what “The Double Life of Veronique” is about, with the addition that only the filmmaker, only Kieslowski, knows both of the women. Are they the same woman? No. Why are they so similar? Perhaps because there are only so many differences that are possible. Why does the second woman seem to feel a fleeting moment of pain when the first one dies? Kieslowski is not interested in the answers to such questions, because they would be meaningless speculations. But the possibility of such connections between lives is infinitely interesting. To think about them is to touch the mystery of consciousness. When I do think I see myself at a distance, by the way, I never hurry to catch up. What if I were right? What would we say to each other?